a. Why Biafra Is Our Heart Desire. b. Referendum or Direct Freedom: The Possible Effects And Barriers Likely To Be Encountered And The Way Out. Biafra is the hearts desire of both the old and young in Biafraland today because we are aspiring for a better, greater and happier future; even if not for our own benefit as the elderly ones, then at least for the benefit of our children and the generations yet unborn. Had the declaration of Biafra independence in 1967 by the late Biafra hero, Lt. Col Odimegwu Ojukwu been successful and not terminated by the genocidal Nigeria government and their cohorts, by now there would have been be nothing like marginalization, incessant massacres, and gross human rights abuses of Biafrans today. Therefore, if we follow the footsteps of Ojukwu to fight for Biafra restoration and then, succumbed, then it simply signifies that we want to remain slaves in Nigeria forever. God forbid! The prayer of all parents is for their children to live long and prosper in life, there is not even an atom of hope that under Nigeria, Biafrans will be regarded as human beings, not to talk of a brightened future for the children and youths of Biafra endowed with great talents and wisdom. It is as a result of all these and more, and knowing without a shred of doubt that we are not Nigerians and can never be,that we want to Biafra restored. We were able to gather that about 65% of the people said that they want direct freedom, 25% said it should be done through referendum, while 15% said supported both, noting that all they want is freedom. Now, lets discuss these methods. Do we really need direct method of freedom? * Its legally approved that when a people longing for independent could not meet the requirements for a referendum, direct freedom is granted to them. Biafrans are hardworking and the most travelled people known till today in the world. Not that we will not meet the requirements if referendum is conducted, however, the fact remains that 30% of the Biafra populace are based abroad and all of them wants Biafra restored as an independent nation. This raises fear that their referendum votes may not be counted unless done electronically, or unless theirs is to be done in the various countries where they reside, which will be very difficult to handle. If they are not allowed to participate, their individual rights to decide their freedom will be totally denied them once again. Secondly, we have paid lots of prices / sacrifices for our freedom. Between 1967 and 1970 alone, over 3.5 million Biafrans were killed during the civil war, making it one of the most deadly genocide recorded in the world. Even till date, innocent Biafrans have not ceased to extrajudicially killed by the murderous Nigeria security agents. We were free before the British colonists came to tie us together with the Hausa Fulani and Yoruba people in Nigeria. That same freedom is required now, and asking for a referendum is just a waste of time and energy because Biafrans are already fed up with Nigeria. WILL DIRECT FREEDOM POSE ANY THREAT TO BIAFRA RESTORATION? The Nigeria soldiers, as well as Nigeria as a whole are against Biafra restoration, and we have seen how they posed threats to Biafrans in different dimensions and arrive at the same point, which is injustice. Just take a look at the Ecowas court proceedings on Nnamdi Kanu's case. They Ecowas judicial panel handling the case are making it clear that they have been bribed by the Nigerian government to delay their rulings pertaining to the unlawful detention of Nnamdi Kanu, and the gross abuses of his fundamental human rights, because they are against the restoration of the sovereign state of Biafra. Did Kanu commit any crime that justifies his continuous incarceration for about two years in prison? This is indeed an injustice at the highest order. Sometimes i do put this question to myself and Biafrans at large- "why is the international community silent over Nnamdi Kanu's incarceration in Nigeria? Or have they not heard that the leader of the Indigenous People Of Biafra is being detained in Nigeria for demanding for self determination for his beloved people of Biafra"? They knew everything, but they are just trying to suffocate justice. Nigeria is finished because their desperation to suffocate justice for Biafra and Biafrans in general have proven to be a disastrous path which they have chosen. 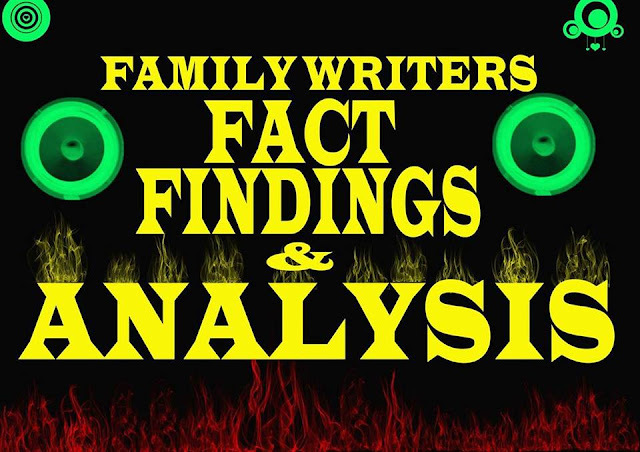 We the FWFFA team are using this week's edition of Family Writers Fact Findings and Analysis to bring to the knowledge of the world, that there is every need for them to see to the welfare of the indigenous People Of Biafra who are being subjected to all manner of inhuman treatment in Nigeria. Many countries who got their independence once sought for it and it was granted unto them. Why must Biafra's case be different? The right thing for the world leadership to do now is to organise a very valid poll for Biafra restoration, and not the kind that is only valid on social media of which after the signings will be trashed. Our hearts is no longer interested in one Nigeria, something needs to be done and urgently because all the abuses Biafrans are going through are masterminded by the world leaders who benefit from the stolen resources in Biafraland. If not , let them do something and support the freedom of Biafra. With this, we end this week's edition of FWFFA. Remain blessed throughout this week. We hope to meet again next week. GOODBYE.